The Effect of Culture System on Benzaldehyde Biotransformation by Cultured Cells of Silybum marianum (L.) Gaertn. Asghari, G., Mahmudi, S. (2005). The Effect of Culture System on Benzaldehyde Biotransformation by Cultured Cells of Silybum marianum (L.) Gaertn.. Iranian Journal of Pharmaceutical Sciences, 1(2), 91-94. Gholamreza Asghari; Shohreh Mahmudi. "The Effect of Culture System on Benzaldehyde Biotransformation by Cultured Cells of Silybum marianum (L.) Gaertn.". Iranian Journal of Pharmaceutical Sciences, 1, 2, 2005, 91-94. Asghari, G., Mahmudi, S. (2005). 'The Effect of Culture System on Benzaldehyde Biotransformation by Cultured Cells of Silybum marianum (L.) Gaertn. 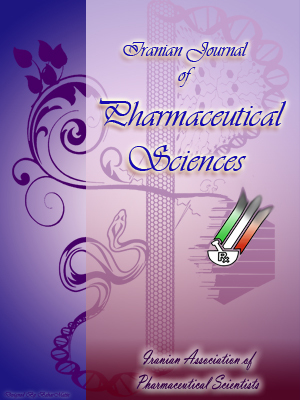 ', Iranian Journal of Pharmaceutical Sciences, 1(2), pp. 91-94. Asghari, G., Mahmudi, S. The Effect of Culture System on Benzaldehyde Biotransformation by Cultured Cells of Silybum marianum (L.) Gaertn.. Iranian Journal of Pharmaceutical Sciences, 2005; 1(2): 91-94. The abilities of Silybum marianum cell culture to biotransform benzaldehyde to benzyl alcohol in three culture systems were compared. Callus cultures of Silybum marianum were established from seedlings, and healthy suspensions and immobilized cultures grown on the Murashige and Skoog medium. S. marianum cells were immobilized in both agar beads and fiber cotton matrixes. Benzaldehyde was fed to S. marianum cell suspension and immobilized cultures. Biotransformation reactions were detected over 24 hours of incubation. The cultures then were extracted with dichloromethane and the extracts were subjected to GC and GC-MS analysis. The S. marianum culture systems exhibit different conversion rates in the reduction of benzaldehyde. Immobilization seemed to have an effect on the secondary metabolism, the cells immobilized in fiber cotton matrix were more efficient at performing the reduction process than both the freely suspended and agar immobilized cells. The ability of cultured plant cells to biotransform substrate appears to be dependent on the type of the culture system. Several aromatic aldehydes are among the most important aromatic flavor compounds used in the food and perfume producing industries. Silybum marianum (L.) Gaertn. (Asteraceae) is an annual or biennial plant, native to the Mediterranean area, which has now spread to other warm and dry regions. S. marianum has been cultivated for production of the flavonolignans, silymarin, which is a component in herbal remedies for the treatment of bile and liver diseases . Cell cultures of S. marianum have been studied in order to investigate their abilities to produce phenols and flavonolignans [2-4].The growth and flavonolignan production of suspensions were tested using different concentrations of KNO3, KH2PO4, iron and calcium . Flavonolignan production from S. marianum root cultures has also been reported . Biotransformations are increasingly being used in the manufacture of specific chemicals, especially flavors and fragrances . Several reports on the biotransformation of benzaldehyde and other aromatic aldehydes as precursors for the production of aromatic alcohols using plant cells and microalgae have been published in the literature [8, 9].However, it was reported that benzaldehyde was readily reduced to benzyl alcohol by S. marianum cell suspension culture but no conversion was detected when cinnamaldehyde was introduced to the cultured suspension cells of S. marianum . So far, there is no report on using S. marianum immobilized culture system in the biotransformation of benzaldehyde. The seeds of Silybum marianum were surface sterilized in 30% w/v hydrogen peroxide containing 1% Tween 80 for 2 min, and then they were germinated on wet filter paper in Petri dishes in the dark at 25 ºC. The cotyledons were then transferred onto the Murashige and Skoog media containing 5 ppm ascorbic acid, 2ppm 2,4-dichlorophenoxyacetic acid, and 0.1 ppm kinetin . Calli were maintained by subculturing every 4 weeks, and suspension cultures were formed by agitation of 5 g callus to liquid medium until a suspension of free cells was formed.The suspensions were then placed on a rotary shaker running at 100 rpm, and were maintained by subsequent subculturing, using a dilution of 1 to 2, into new fresh liquid media.The callus and suspensions were maintained in a 12 h light/dark cycle at 27 ºC and were subcultured every 4 weeks. The suspension cultures grown over more than six generations were used for substrate feeding and bioconversion studies. For fiber cotton immobilization, cubes of 2 cm of Luffa (Luffa cylindrica) were autoclaved in water to get ride of any chemical which might have been released into the culture medium. The cubes were transferred to cells suspension. The free cells were entrapped into fiber holes. The fiber cotton matrixes containing the immobilized cells were rinsed three times with fresh medium and transferred into 50 ml of MS medium. For agar immobilization, a total of 10 ml of free cell suspension were mixed with 20 ml of sterile agar solution (3%). The cells were entrapped into solid agar by cold gelation. Then, the agar matrixes containing the immobilized cells were cut into cubes of 2 cm and transferred into 50 ml of MS medium. The substrate (benzaldehyde) was obtained from Sigma. Chemical purity (greater than 98%) was determined by capillary gas chromatography (GC). Substrate was dissolved in a water-miscible solvent [ethanol 70%], which resulted in good mixing of the substrate upon addition to the aqueous medium. The substrate was added to suspension cultures to make a final concentration of 100 ppm, cell volume [50%p.v.]. Control readings were made without the addition of substrate to cultures and with the addition of substrate to cell-free medium.The cultures were incubated under the conditions mentioned above. After the incubation period, the flask was swirled to ensure good mixing and two samples were removed with a 10-ml presterilized, glasstipples pipette. A new pipette was used for each sample. After 24 hours both the cells and the media were extracted using dichloromethane, followed by centrifugation [1000 g for 5 min]. The extract was reduced to a volume of 100 ml under nitrogen, then 0.1 ml of it was analyzed. Figure 1. Biotransformation of benzaldehyde using Silybum marianum cell cultures. Figure 2. Conversion of benzaldehyde to benzyl alcohol by different types of Silybum marianum culture systems. Gas chromatography analysis was carried out on a Perkin-Elmer 8500 gas chromatograph with FID detector and a BP-1 capillary column (39 m x 0.25 mm; film thickness 0.25 mm). The carrier gas was helium with a flow rate of 2 ml/min, the oven temperature for first 4 min was kept at 60 ºC and then increased at a rate of 4 ºC /min until reached 280 ºC, injector and detector temperatures were set at 280 ºC. Confirmation of peak identity was effected by cochromatography with standards and GC-MS analysis. The mass spectra were recorded on a Hewlett Packard 6890 MS detector coupled with Hewlett Packard 6890 gas chromatograph equipped with HP-5MS capillary column (30 m x 0.25 mm; film thickness 0.25 mm). Mass spectrometer condition was as follows: ionized potential 70 eV, source temperature 200 ºC [12, 13]. The biotransformation of benzaldehyde by the S. marianum is summarized in Figure1.Benzaldehyde was readily reduced to benzyl alcohol by all three culture systems prepared by different methods. The S. marianum culture systems in this study exhibit different conversion efficiency in the reduction of benzaldehyde. Immobilization seemed to have an effect on the secondary metabolism. The cells immobilized in fiber cotton matrix were more efficient at performing the reduction process than both the freely suspended and the agar immobilized cells. Many of the engineering advantages of immobilization were demonstrated on biotransformation. The physiological effects of immobilization on cellular metabolism and secondary biosynthesis have been well documented in a number of systems . The S. marianum cells immobilized in fiber cotton matrix reduced benzaldehyde effectively (>95). The biotransformation of benzaldehyde in S. marianum immobilized by fiber cotton matrix was more efficient than that of S. marianum immobilized by agar matrix (Figure 2). This result may indicate that the enzymes involved in the reduction reactions of benzaldehyde had less access to the substrate. The concentration of substrate may be altered by partitioning or adsorption onto the matrix. The physiology of cells exposed to these substrate concentrations may differ from that of suspensions not exposed to any matrix effect. Also, physical protection of the matrix may involve more intimate contact between the cell and the substrate. In conclusion, the ability of cultured plantcells to biotransform substrate appears to be dependent on the type of culture system.Immobilization can have positive effects such as enhance secondary biosynthesis and partial product secretion. Immobilization may also have negative effects such as inhibition of secondary metabolism, and reduced reaction rates compared to suspensions. Clearly for biotransformation process to be successful, the positive effects of immobilization must be completely exploited and the negative effects must be circumvented. This work has been supported by research council of Isfahan University of Medical Sciences. marianum. Phytother Res 1996; 10: S25-7. Ferreiro P, Pais MSS, Cabral JMS. Production of silybin-like compounds in cell suspension cultures of Silybum marianum. Planta Med 1991; 57: 2–33. flavolignan formation in Silybum marianum cell cultures. Res in Med Sci 2003; 7: 101-3.
in cultured cells of Silybum marianum. Plant Sci 1999; 144: 63–8. marianum transformed and untransformed root cultures. Fitoterapia 2000; 71: 379-84. Cheetham PSJ. The use of biotransformation for the production of flavours and fragrances. Trends Biotechnol 1993; 11: 478-81. Suga T, Hirata T. Biotransformation of exogenous substrates by plant cell cultures. Phytochemistry 1990; 29: 2393-406. Ingrid LH, Shane R, Helen S. Biotransformation of aromatic aldehydes by five species of marine microalgae. Phytochemistry 1999; 51: 621-7. Asghari G, Saidfar G, Mahmudi SH. Biotransformation of aromatic aldehydes by cell cultures of Peganum harmala and Silybum marianum. Iranian J Pharm Res 2005 (in press). Murashige T, Skoog F. A revised medium for rapid growth and bioassays with tobacco tissue cultures. Physiol Plant 1962; 15: 437-9. Adams RP. Identification of Essential Oils by Ion Trop Mass Spectroscopy. California: Academic Press, 1989; pp.1-301. methyl silicon and Carbowax 20m phases. J Chromatogr 1990; 503: 1-24.
immobilized plant cells. Biotechnol Lett 1989; 11: 243-8.